reduce the risk of ejection during a crash. Offer drivers a better rear field of view. 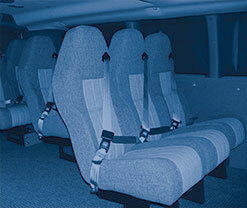 SafetyVan employs an exclusive massive steel floor grid that anchors all of the seats in the passenger compartment. The concept here is that “if, in a collision type accident, the occupant stays belted into their seat and the seat stays where it is mounted in the van, the chances are increased that the passenger will sustain less severe or no injuries”. Automatically lit upon ignition for greater visibility of your vehicle by others. 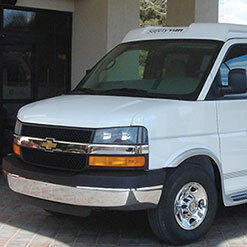 ABS helps the driver maintain steering control during hard braking situations. Dual Front Air Bags Help reduce injuries to the driver and front passenger in the event of a frontal collision. Ergonomically designed individual seating for each passenger includes head support and 3-point belt system that is always “right at hand”. The shoulder belts are kept off the floor and wall and stay clean and immediately available for use on each trip. Included are 2 Latch Systems with tether straps in the first and 2nd row passenger seats which facilitate installation of child safety seats. Makes ingress and egress safer and more convenient. Internal Roof Reinforcement. Strengthens the roof support mechanism but does not reduce interior headroom (good for tall passengers) and doesn’t increase the overall outside height (makes car wash and inside parking areas more accessible).